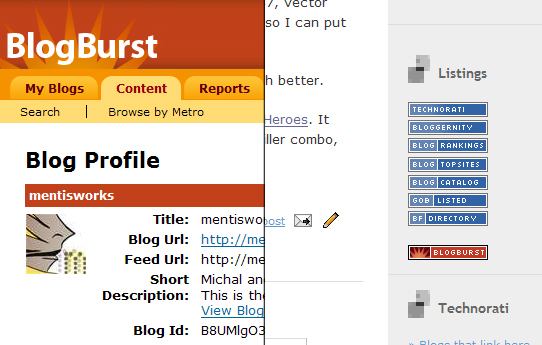 A few days ago I got an email with the invitation to join BlogBurst. So I did, and just today I got another email which said "Congratulations! Your blog has been reviewed and is now active in the BlogBurst network." So, yay for BlogBurst, and yay for us! I've put the little BlogBurst button down in the "listings" section and decided to use the one they provided instead of making one to match the rest. I figured it deserves to stand out a little :D.
Now that we're part of the BlogBurst network one can only hope that we'll get a bit more traffic. It probably also means that I need to get myself in gear and write more quality content, too. I suppose I should finish those bigger articles I'm working on then. If you're curious, they include a piece on my history of personally most significant video games in terms of storytelling (still can't think of a shorter title for that one) and a basic guide to creative painting. Now aren't you excited!